You know how it is. Once you get a bug in your head for a certain embroidery thread, you can’t really let it rest until you find it and try it. Recently, we chatted a bit about the old whitework threads that can be found today, used, from various sources – estate sales, grandma’s attic, and so forth. Often (but not always), these threads are not really usable. They’ve been exposed to bad conditions or faulty storage for too long, and thread rot has set in. If the threads are just dirty, it’s one thing – they can be cleaned. But if they are weakened due to rot, that’s a different question. So, questing about for new extra fine whitework threads, I took the plunge and bought some threads from Marie Suarez in France. If you’re not familiar with Marie Suarez’s whitework embroidery, you really should check out her whitework embroidery gallery. You will such exquisite embroidery there! Much of it is the type of whitework that is done with very fine threads, so I knew Marie must have very fine whitework threads available. And she does. She carries several weights of floche – very, very fine floche, in size 60, 80, and 120. You can find them in these whitework threads in her boutique, here. The threads are a little expensive – 3.5€ per 30 meters, which translates into about $4.77 by today’s exchange rate. But I’ve looked high and low for new and available fine whitework threads in these sizes – new, whole, complete threads; not larger threads that have been broken down into weaker single plies, or threads that are decades old that are already wearing out, but brand new threads in these sizes. And I’ve had no luck finding them anywhere. So I’m very happy to find a source for them at last! 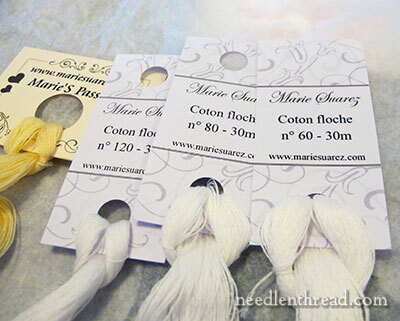 If you’re looking for very fine whitework threads to use for delicate monogramming, then check out the whitework threads available through Marie Suarez. And if I ever come across another source, I’ll keep you posted! January 14, 2015 Exquisitely Fine Detailed Embroidery – Can You Guess? Speaking of whitework – did you see this stunner???? This was posted on the facebook page of Embroiderers’ Guild of Victoria and Sampler World. Ahhhhh – that’s lovely! I would love to do a sampler like that. Maybe some day! Oh I’m so glad you found somewhere in Europe to buy Floche thread, I can’t purchase Floche thread anywhere in the UK, Europe, I can only buy it in America and with postage this can be expensive. It’s a shame she only sales white Floche thread and not other colours but at least that’s something, when I get down to embroidering whitework I know where to buy my thread. Thanks for sharing this with us Mary. Yes thank you for the new thread for white embroidery,But me I buy too old thread fine but good, perhaps it is more easy in France, I love Cartier-Bresson because it was nostalgic.But that true very very fine thread for this embroidery,have a good address is important even if it is not in the country, and do not hesitate to even buy 2 or 3 skeins when one is a fair bit of money or you want to discover, and I do I am not ashamed even outside of France. Thank you Mary, it is true that this threads are beautiful …. Good morning, Mrs. Corbet. Forgive me if this is way off topic, but it’s something that’s been nagging at me for quite a long time. I’ve only ever used basic, 6-strand DMC cotton floss. I want to try something new but don’t feel ready to tackle another fiber like silk, wool, or linen. The other cotton threads I’ve learned about through your blog, are Pearl Cotton, Floche, and Cotton Boarder (I don’t think I got that last one correct) My question is, which one would be good for moving forward? Also, How do you feel about the DMC “Satin” threads? Well, I like coton a broder 25 – it has a nice range of colors. It’s like using almost 2 strands (not quite 2 strands) of regular floss, but it is not divisible, and it creates a nice, smooth surface with stitches like satin stitch. And of course, it looks great in practically any kind of stitch. Satin floss by DMC is pretty, but I use it more for craft embroidery, like embroidery on paper. It works really well for embroidery on paper. But for regular surface embroidery, I generally avoid rayons and synthetic fibers. Thank you so much for the information! I think I’ll avoid spending so much for the “Satins.” I don’t much like synthetic fibers either. I feel a lot more comfortable in weighing my options now. Mary, Thank you for pointing out the fine threads. Funny I hadn’t seen her page of threads yet I am working through one of her books with a hundred other ladies, someday it will be a cloth book. Tania, Thank you for sharing Jeanny’s blog post. Beautiful whitework. On her site you will find several training sessions among which … several ones were never finalized. The threads arrived quite quickly, so her delivery service was good. I didn’t realize she was in Belgium (oops! what would Poirot say?) Sorry about that! I’m sorry to hear she did not follow through with a class. But that is good to know. all my lessons are finalized. I recognize that I was late for “les colombes” with the last lesson but my lessons are made with a very big quality and if you were serious, dear Segers, you must say it ! here, in Belgium, I’m “master in embroidery” and my reputation is very good. also in France. I hope that you’ve real subscribe on my lesson. I thank Mary to speak over my threads that I’ve made in France. These threads don’t more existed and the white embroidery is so beautiful with it. Now if only I could read (or write/speak/understand) French — or if Marie had a drop-down to select the language in which to view her site. Perhaps someone who is fluent could suggest it to her on behalf of the rest of us. Thank you for this link! I have an 1850s Ayrshire embroidery christening gown (family heirloom) and it’s so fine I can’t distinguish the individual threads – it’s great to know they are still available to other embroiderers even if I never achieve the skill to use them myself. Can’t help wondering, though – all this discussion of threads for whitework – you had proposed a whitework Secret Garden – any connection? But when I do get started on that, I’ll be using threads that are much more easily available. Thank you, Mary, for the Marie Suarez post. I have been receiving emails from her for some time, and was thinking about taking a class. Although Mme. Suarez is Belgian, luckily for me, the posts have been in French (which I can read), and not Flemish or Walloon (I would be totally lost!). Does anyone have any experience with her classes, please? Flamand speak a language near Neederland but Wallon speak French.Belgium is very particular country for the language!. Wendy ask the same question for english version with Marie Suarez.I have never buy for her, but I find when you know a information, you can say people, same sharing from Marie Corbet.I hope Marie Corbet give a very little projet for us. I am scared with th very fine thread !. And if you and other girls (womens!) want the price for shipping to England or U.S.A from France (near Belgium),I can because I don’t like people want more money for shipping, if you know, you know! Sharing again! Thanks so much for the conversion chart for DMC and silk mill colours. I love their silk threads. Dear mary, sorry to use you as a subsidiary but marie suarez asks me to be serious what i really do when saying that she never ended the colombes session. Each time, she promised to finalize the session – she even promised a gift/surprise for our patience – this can be proven by all the messages she sent me and i am ready to forward them to you if you ask for it. What she never did and the last time i asked her to ´subscribe ´ again – hoping it would be the last time after so long, she dis not even answer. Once, on my suggestion, we all sent a message at the same time saying that this was unfair and not legal, she immediately sent a new lesson but for the next one, she did not even react. How can we trust someone with such a behaviour ? Do not think i am someone too difficult : i took part to your ´birds session ´ and to many more from jane nicholas, alison cole, berlin embroidery … And this at my 100 % satisfaction if not more (quality, supplies, schedule, explanations… Everything perfect). All these sessions even enabled me to start in november teaching goldwork in an art school in belgium. Thanks for clarifying. I’m sorry you had a bad experience! I would think Yvette Stanton (you introduced me to her work) would have a supplier since she does SO MUCH white work. But imagine you are in contact with her now and then. Thank for the link to Marie’s site. Exquisite work. But I must say your thread painting is much better! I really want to buy these threads. I am having difficulty with Marie’s web site and contact as I only speak and write English. Can I purchase these from any one else in the world? Hi, Sue – I used google translate wherever I ran into language difficulties on the site. She accepts Paypal, which makes it a little easier to go through the checkout process. I don’t know of anyone else who sells whitework threads this fine. I wish they were more widely available! If i can help you for unterstand french/english, i can within site of Marie Suarez, but I don’t know where you have difficult. You can buy for U.S.A. After you buy, you receipt your “passeword secret” by mail. In France, it is the same, we are not the very fine thread, only old and if you are lucky. Marie Suarez is only women,I know. Mary, does White Threads in Austrailia carry these high End white threads? No, they don’t. I think Yvette said something about looking into finding them, but right now, they don’t. I’m sure if she ever gets them and can stock them, she’ll let everyone know. I’ve been looking to find fine whiteworking threads myself. I’ve been working with the DMC Floche (as their 40 coton border is no longer available) but I find that it’s a bit thick for the Ayrshire embroidery I’m trying to mimic. I was wondering if you ever did a review of the Marie Suarez threads? I’m thinking of purchasing some of then myself but was wondering what your option of then turned out to be. Hi, Kit – I’ve bought them. I don’t think I’ve reviewed them, but I have a few of her whitework threads in the finer weights. I think they would be quite satisfactory for Ayrshire embroidery.